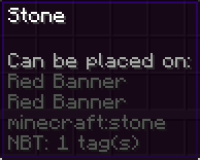 Wall banners use the same translation strings as their corresponding standing banners (block.minecraft.COLOR_banner), rather than just using their own. This bug was caused by the fix of MC-122579. This will cause confusion as there's no distinction between the strings. On top of that, it's inconsistent with skulls, heads, signs and (redstone) torches. Even though signs, skulls, heads and (redstone) torches are named Oak/Spruce/Birch/Jungle/Acacia/Dark Oak Wall Sign, Player/Skeleton/Wither Skeleton/Zombie/Creeper/Dragon Wall Head/Skull, and (Redstone) Wall Torch respectively, Wall Banners are not.